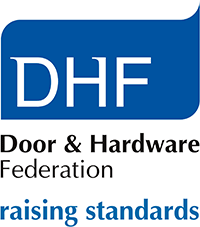 When an alarm is not enough, London based Able Shutters design, manufacture and install traditional steel roller shutters. 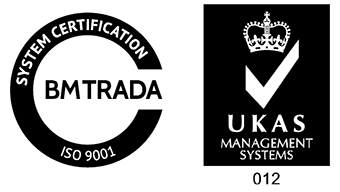 Model AS20 offers you, proven protection for doors, windows and shop-fronts ideal for schools, hospitals, medical centres, warehouses and factories. 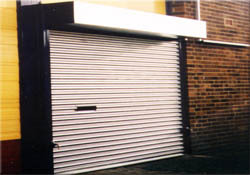 When your Able security shutters are down your property is safe and secure ! also see security roller grilles for shops,restaurants. 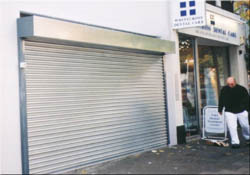 Able roller shutters are constructed from galvanised steel lathes/slats 50mm flat or 75mm curved in either 20 or 22 gauge thickness dependent on space/span to be covered, interlocked together to provide solid vandal,theft proof barrier, mounted with in a 3mm and 6mm thick steel sections which are securely connected to the building, supported by a counter balanced roller spring mechanism or optional electric motor housing designed to offer easy roll up and roll down of your security shutter.